Bergen County Chiropractor • Insurance Accepted! 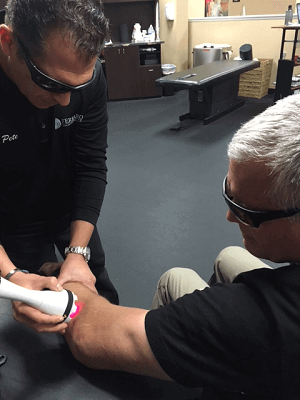 Dr. Peter Ferraro administering LightForce™ Laser Therapy to former NFL player Bart Oates, the proud owner of three Super Bowl rings, including two with the New York Giants. NFL Alumni are using LightForce™ Deep Tissue Therapy Laser to alleviate aches and current pro athletes use it to stay in the game and perform at a high level. Dr. Brian Kelly, Orthopedic Surgeon, had this to say about his experience with laser therapy and the potential benefits former players may experience within this program. “The results we have seen with deep tissue laser therapy in retired athletes proves promising in the treatment of chronic degenerative joint pain, soft tissue dysfunction, and conditions associated to trauma, overuse, and muscular imbalance.” Dr. Kelly serves as Head Team Physician for the New York Rangers and an Associate Team Physician for the New York Giants. Over 100 professional and collegiate teams utilize the LightForce™ Deep Tissue Therapy Laser to keep their athletes in the game and performing at a high level, including 16 current NFL teams. These teams are using laser therapy to achieve quick and lasting pain relief for acute conditions, chronic ailments and to accelerate post-surgical recovery.